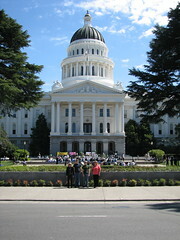 Sunday morning in Sacramento greeted us with warmth and sunshine. So it was off to Ellen's church in shirt sleeves. Christ Community Church of Carmichael is a large Reformed Church which just finished a new auditorium. The youth groups had just completed spring mission trips, so the worship service consisted of testimonies and a challenge from the youth pastors. After church, we toured the capital grounds and Old Sacramento. Later in the afternoon, we took a walk around Ellen's neighborhood. It was great strolling North Sac in the warm sunshine, with the scents of spring and the 'sense of danger.' The spring day was topped off with steaks on the barbee.